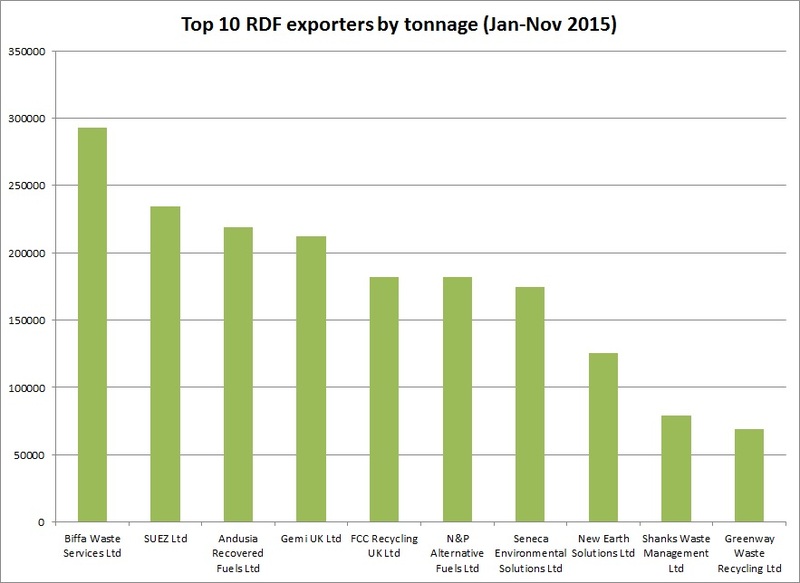 Exports of refuse derived fuel (RDF) from England during 2015 are expected to pass a record total of 2.75 million tonnes when provisional Environment Agency data for the final month of the year is published in the coming weeks. The latest provisional international waste shipment figures published by the Agency for the first 11 months of the year already put the RDF export total at a new high of almost 2.57 million tonnes, which compares to the total 2.37 million tonnes exported throughout the whole of 2014. And, with more than 200,000 tonnes of material exported throughout each month of last year, it is expected that the 2015 total will hit a new high of around 2.75 million tonnes sent abroad for energy recovery. Nevertheless, the level of export growth is clearly slowing and some UK RDF operators expect 2015 to be the final year of growth, with attention beginning to turn to the domestic market as continental incinerator capacity continues to fill up. 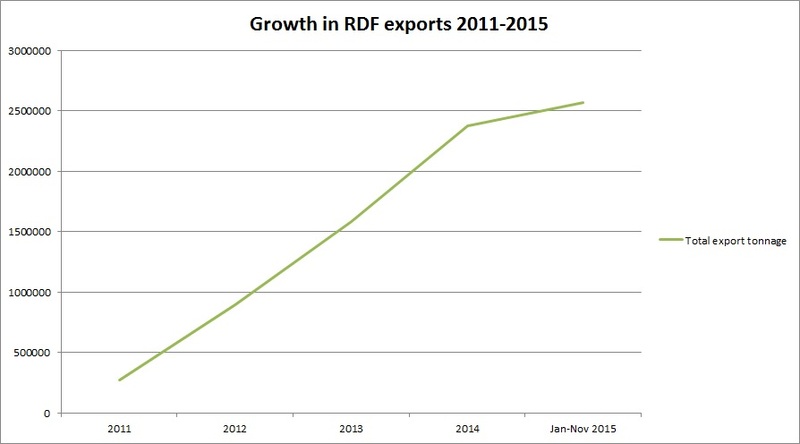 The tonnage of RDF exported to Europe in 2014 grew by more than 750,000 tonnes compared to the previous year when 1.58 million tonnes were exported (see letsrecycle.com story). This was significantly higher than the 892,900 tonnes recorded as exported during 2012 and just 272,000 tonnes during 2011. However, 2015 year-on-year growth looks likely to be less than 400,000 tonnes. is period, which accounts for 11.39% of the overall market share. Biffa is closely followed over this period by SUEZ (234,695 tonnes) and Andusia Recovered Fuels Ltd (219,224 tonnes). 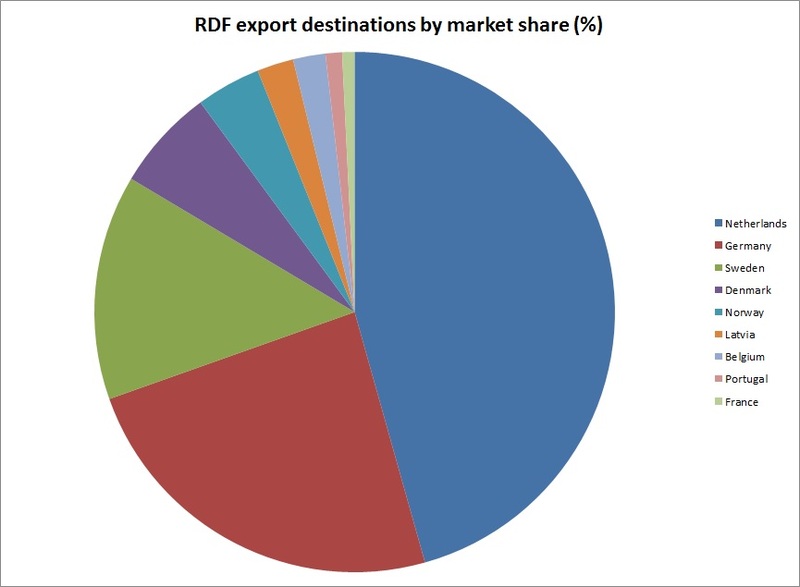 12 countries in Europe received RDF from a total of 55 UK operators between January and November 2015, according to the data, with the Netherlands still the largest recipient of UK material taking in close to 1.2 million tonnes. The second largest recipient over this period was Germany at 611,756 tonnes followed by Sweden at 357,510 tonnes. Commenting on the figures, Steve Burton, co-director at Andusia Recovered Fuels Ltd, said: “My expectation for the annual figure is approximately 2.75m tonnes for 2015, which is a 16% increase on 2014. The latest international waste shipment data follows the publication of the Environment Agency’s official definition of what is expected of refuse derived fuel producers in England in November 2015, which has raised some concerns over consistency across other parts of the UK (see letsrecycle.com story).